← Authentic Self or Midlife Crisis? I’ve spent a lot of time thinking about this post while writing it and some time sitting on it while not writing it. It is normal as a community grows that changes upset some and as we have grown we have become more diverse. Here at The Hero’s Spouse we have some who fear that we are moving away from our Standing roots and others on the opposite side who are concerned that we are not accepting enough of the reality of MLC marital outcomes—divorce. We have religious LBSs who feel they are mistreated because of their faith and less religious or non-religious LBSs who feel they are mistreated for not being religious. We have Covenant Keepers who are frustrated and insulted when well-meaning LBSs encourage them to move on from their marital Stand and LBSs who stop Standing and feel judged for moving on from their marital Stand and dating. Tolerance is an important concept in all directions. Some LBS choose to be Standers until they reconcile their marriage or they or their spouse dies—they are the Covenant Keepers. Those of you who are not in that group, please respect those who are. I understand encouraging Standers to move on and some who seem as though they will Stand forever may not be choosing to Stand as a Covenant Keeper and are instead stuck as an attached victim, but this is not the case with everyone who has been Standing for more years than you think is appropriate. Not everyone feels the need to fill the lonely void with a romantic partner. The same goes to those of you who are Covenant Keepers or a bit more adamant in your Stand. It is up to each individual to choose whether to Stand and how long to Stand. As a site that is meant as a safe place for Standers I admit that I lean toward Standing and I feel that I am better when advising toward Standing, but I also understand not all people or situations are meant for Standing. Please respect the choices of those who choose to Stand Down. I did not create The Hero’s Spouse to be either a secular or religious website. I am Christian—Lutheran to be precise—and my perception is through my faith. But as a Lutheran I do not believe that we (Lutherans) have some monopoly on what is the right and proper doctrine or interpretation of scriptures or the cosmos in general. I believe that all faiths hold universal truths and that it is unfair and even disrespectful to consider things with a black-and-white if mine is right, then another must be wrong type of view. I joined or read a few religious websites in the beginning of my Stand and was turned off by them because I felt they were judgmental and their way was the only way—this was not necessarily the tone of the site leader, but of the masses, or at least those who were the most vocal. In general the view (as I interpreted it) was that the only way to get to reconciliation was by having a personal relationship with Jesus Christ. 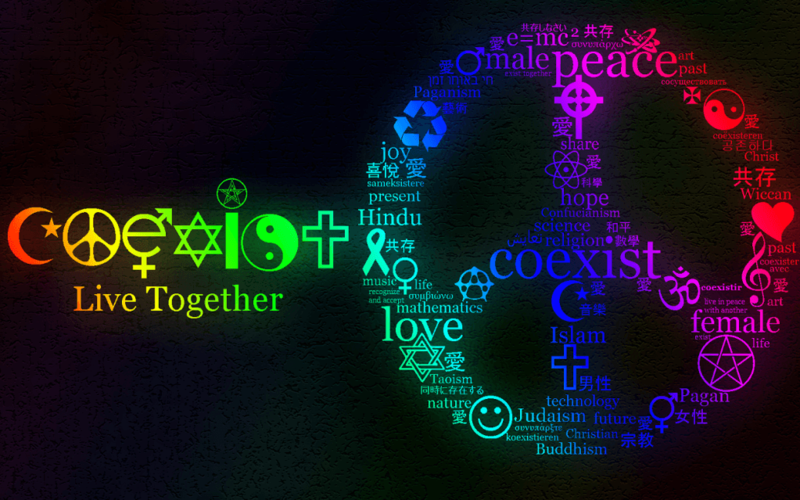 So what about Buddhist, Muslim, Jewish… Standers or those who are agnostic or atheists? Is the chance of reconciliation for them 0% unless they have a religious conversion? They may all practice the Unconditionals with genuine open hearts and I personally do not believe that the God I believe in would deny them the same blessings He gives me and other Christians just because of how they view or do not view Him/Her/Them. My vision for this site is that rather than being either religious or secular, it is infused with the tolerance of the Unconditionals, that we trade judgment for empathy and that we recognize the face in the mirror as the face of everyone. Rules/Moral Code In some languages the closest translation for the word religion is also used to mean law. Dictionary definitions often focus on religion being a belief in a deity or supernatural power, but this omits the important social aspect—the binding together. True, at the heart of many religions is a supreme deity(or deities), but that definition leaves out the organization and creed—what is believed about the deity and it excludes faiths without a supreme deity such as Buddhism. Faith can be personal and without structure, but religion brings and binds a group of people together and provides them with explanations about the nature of the universe. It also causes discord when met with disagreements and yet disagreements even within a single denomination are inevitable; within a single congregation of people there are as many ideas about their shared religion as there are congregants. Dictionary definitions often focus on religion being a belief in a deity or supernatural power, but this omits the important social aspect—the binding together. True, at the heart of many religions is a supreme deity (or deities), but that definition leaves out the organization and creed—what is believed about the deity and it excludes faiths without a supreme deity such as Buddhism. Faith can be personal and without structure, but religion brings and binds a group of people together and provides them with explanations about the nature of the universe. It also causes discord when met with disagreements and yet disagreements even within a single denomination are inevitable; within a single congregation of people there are as many ideas about their shared religion as there are congregants. It seems ironic (to me) that the core of many and perhaps most religious faiths is Grace and Love—two things that are about tolerance and yet religion is the motive behind so much conflict and hatred. This is a website geared toward Standing for marriage as well as healing from the trauma that can occur as a marriage goes through one person’s midlife crisis and perhaps even ends. Many come here Standing, some are undecided and choose to Stand after visiting, but Standing forever or even until is not what everyone will do—rather those who are Covenant Keepers (Stand until reconciliation or death of themselves or their partner) are in the minority. This site is not geared solely for Covenant Keepers or more short-term Standers, rather it accepts both positions. Standing, dealing with a spouse’s MLC and all it entails—infidelity, Monster, legal actions, financial problems, abandonment of children… is something best done within a group of understanding and supportive people; it binds us together. We may be of different faiths and different ideas about shared faiths, but we are all here because we care deeply about marriage—ours initially and marriage in general even though some will stop Standing. We each define Standing for ourselves—many of you may start out with Standing being about marital reconciliation, but that often evolves to Standing for yourself with or without the hope of reconciliation. Some of you will simply accept reconciliation if it happens, but you will no longer have a hope for it, rather if it comes to that you might consider it. There is nothing wrong with that! I will continue to define a Stander as someone who seeks to remain married while his or her spouse is seeking to escape the marriage, but that doesn’t mean you have to define it as such and the term needs a specific definition for clarifying it in my literature. The Hero’s Spouse acknowledges and accepts that you will change as you go through this experience and that you have the right to define what you are doing for yourself. What I am asking from you—The Hero’s Spouse Community—is that you also acknowledge and accept this and treat every person with respect and dignity. That means realizing that those of us who share our faith believe different things about God. What offends one may not phase another ex. A person referencing their God or my God may not be suggesting there are multiple gods, rather such a person may be acknowledging multiple interpretations and beliefs about a single God or more than one if that is their belief system. Above I used the phrase the God I believe in, this is an instance in which I could have (and sometimes have) used the term my God instead. That does not mean I believe in polytheism. Some Christians would probably consider me a heretic for some of the things I believe and that is their right, but it does not mean I am not a Christian and their opinions do not give them the right to attack me, but that is how some are feeling at the forum—attacked for how they interpret their religion or for having no religion, or for how they interpret their Stand and what it means to Stand. The Unconditionals, Grace, Agapé and Forgiveness are boundless.